Smartphones- a way to connect with the people across the globe is best way adopted by the peoples in the world. According to the researches over 5 billion people are using smartphones in their work related to the education or offices and so on and are expected to increase over coming years with the positive impact in society regarding education. Since the reach of mobile phones are increasing day by day, it is essential that education industries should be oriented with the new channel of learning and teaching. With the LMS software or any other technologies, the usage for face to face interaction between the instructor and learners is not problem anymore. Student can now go for online courses and get the benefits of that and can pursue their dream accordingly. They can simply learn by opening the courses in which they have enrolled. Distance education is a way where learners can learn from their home or anywhere they are present and is a simple way to help and pursue their dreams easily without travelling to bigger cities for any coaching institutes. 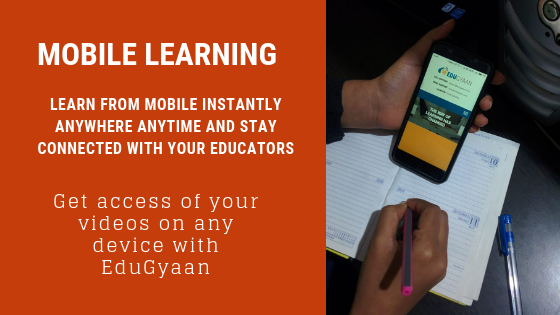 In distance learning, mobile phone/smartphones are best way to connect with the educators and learners. 1. Cost: - It is very cost effective as the most of the students have smartphones in their hand in today’s era. They are less costly as compared to the desktop/laptop. 2. Instant learning: It provides instant learning anywhere which helps the learners to learn and revise their concepts before the exams. 3. Time: Learners can save time and efforts in learning and accessing the material which helps them to utilize their time in fruitful manner. 4. Reach: Educators can reach out to their active learners around the globe with their online teaching. 5. Learning Methodology: With advancement in learning system, the methodology of learning has been changed and transferred to the technologies which helps to save time and money. There are many benefits of using mobile phones/smartphones in education. However, it simply fill the gap between the learners and educators and helps them to connect anytime they want. The future of education through mobile is increasing significantly. Everyone across the globe are using mobile phones for their education and gets aware about all things happening in world which helps them to make one step forward in their learning scenario.